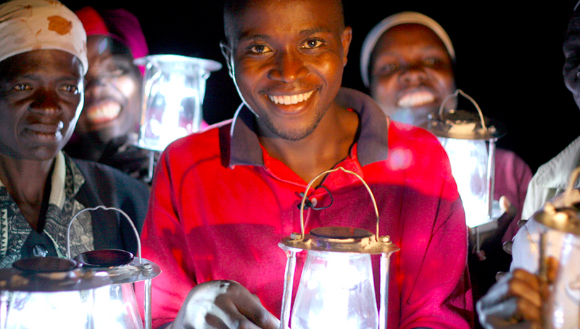 The need for light is high across the African continent, where approximately 70% of households are off-grid and 64% of its imported oil is destined for 19th century kerosene and paraffin lighting. Although the demand is high for solar powered lighting, the opportunities to convert that demand into a social business are not evenly distributed. In many places limited financing, large distances between rural demand and urban financing and supply centers, and consumers’ lack of familiarity with new payment and lighting technologies (the “it’s different!” factor) undermine solar rollout. Yet solar electricity is where we are all headed by mid-century if you believe the IEA. At the 1st Technology Salon Lusaka, technologists and development professionals asked, “What is the Solar Power Opportunity in Southern Africa?“, and by extension similar “green field” markets across the continent? Market opportunity exists at a range of deployment scales and use cases. It’s not just households that want light. Health clinics, schools, farmers, and the hairdresser next door want light to improve the quality of what they do or extend their operating hours. Entrepreneurs need to focus on meeting their demand. With simple solar torches and lanterns, the price points are low enough that relatively large sales can take place over the counter at local shops. Moving up to small household systems, even off the shelf pico units, introduces price barriers to over the counter transactions. Pay-as-you-go (PAYG) models can help households to purchase pico units on installments. mKopa has proven PAYG works at a scale that continues to impress with its growth built on a mobile money backbone. In January 2015, mKopa was moving more than 500 units per day. For other businesses, risk guarantees, often through external support, can make larger orders possible and drive scale. The million-dollar question, specifically in the donor community: Is there commercial viability in any of these ventures? Mobile money is what puts the “go” in PAYG and mobile transfers are growing in Zambia. Examples are found everywhere. MTN and Cargill have a partnership to pay farmworkers in Eastern Province on MTN money. Airtel has similar partnerships and penetration. Cross-network payment companies, notably Zoona, are growing, with more than 700 agents now. It plans to more than double that to 1800 agents by end of 2015. In a country of 14 million, Zambia probably would need more 6,000 agents to get market coverage like Kenya’s (although as more people keep cash on phones, they may be less likely to convert it to paper). However, in the solar lighting PAYG discussion it is important to remember that mobile money development is far more nascent in Zambia than in the neighboring East African context. The actual usage of mobile money is low especially outside of urban areas, although registration may be almost 50%, often because of default registration by MNOs. There is also a need to address the lack of a savings culture, as well as to look at the gendered aspects of both solar and mobile money adaptation. With mobile platforms and notable integration with Facebook, does Zidisha bring a new model that can scale without the middleman MFI? How well will it support businesses looking for a loan to buy a shipment of new solar units? Or households looking to move up the energy ladder away from paraffin? While it’s impact remains to be seen, it offers a unique model and is part of the Vitalite rollout in Zambia this year. Overall, the consensus from the Technology Salon Lusaka on “What is the Solar Power Opportunity in Southern Africa?” is that growing demand for solar will drive mobile money adoption, and the more that consumers use mobile money, the more likely they will feel comfortable paying for the (solar) light with their phone.